A colleague of mine, Richard Lucey, introduced this recipe to me. 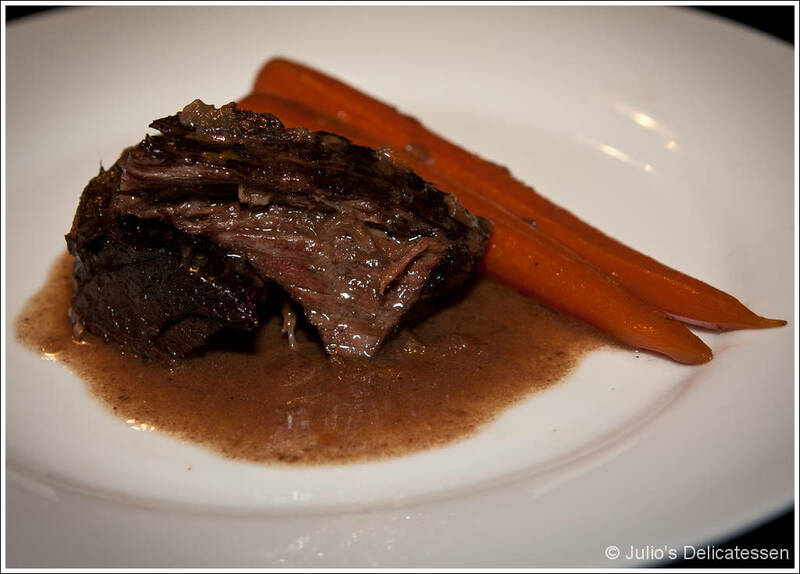 He had eaten Joues de Boeuf at a restaurant in France and decided to recreate it back home in Ireland. When he asked his usual butcher if they had beef cheeks, he was asked “you mean for human consumption?” I found it similarly difficult to find them here in Indiana. If you can’t get beef cheeks, don’t let that stop you from making this recipe – just use chuck (cut into ~8-oz pieces). Preheat oven to 350. Cut each beef cheek in half, pat dry, and season generously with salt and pepper. Heat oil in a large Dutch oven over medium-high heat. Brown meat on all sides – about 10 minutes total. Transfer to a plate. Add the onions, carrots, salt, and pepper. Cook until onions have softened – about 10 minutes. Add wine and orange zest and bring to a boil. Add the beef and return the pot to a boil. Cover with a parchment lid and transfer to the oven until meat is tender (about 2 hours if using neck or chuck, about 3.5 hours if using cheeks). Adjust seasoning and serve.